On July 14, NASA made history by getting to Pluto for the first time as their New Horizons spacecraft soared over the dwarf planet at just 7,550 miles above the surface. It was an awesome accomplishment for NASA and humanity. Well-known astrophysicists and director of the Hayden Planetarium, took the time to tell again his 3.96 million Twitter followers that while Pluto is incredible, it's still a dwarf planet. He tweeted: "Dear Pluto, lookin' good. But you're still a Dwarf Planet -- get over it. Love, Neil deGrasse Tyson." The tweet accumulated over 15,000 retweets and caught the attention of Stephen Colbert, TV host of Comedy Central's "The Colbert Report," who reacted with: "Hey @neiltyson, I'm sick of you hitting Pluto below the Kuiper belt. Come here and pick on someone in your own orbit!" 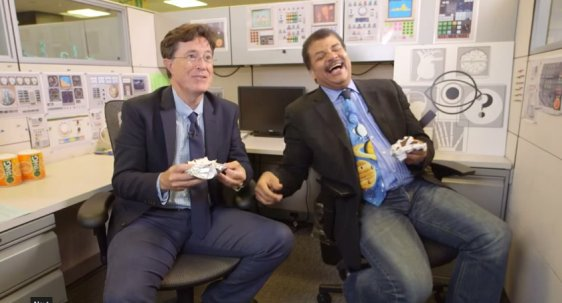 Tyson and Stephen Colbert followed up their Twitter feed in person in this wonderfully informative and funny clip, provided below.